Alphonse Elric is the deuteragonist of the Fullmetal Alchemist series. The younger brother of Edward Elric, the Fullmetal Alchemist, Al is also a victim of the failed Human Transmutation experiment in which Ed lost his right arm and left leg. Having had his entire physical being taken away from him in the aftermath of the tragedy, Alphonse exists solely as a soul alchemically bound to a large suit of steel armor. Now, Al travels with his brother in search of a legendary Philosopher's Stone, an item with the power to restore their bodies to normal. 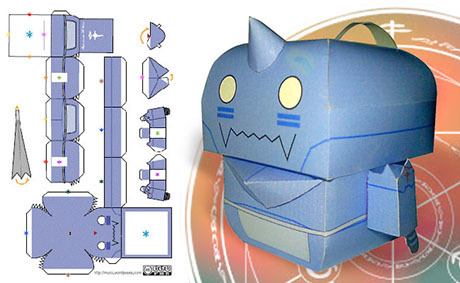 Paper toy created by Murz.